Ruth Grierson and Friends serenade diners. It was six o’clock on a Saturday night, and Main Street in Southwest Harbor was deep in winter slumber. Shops and inns were dark. Sidewalks were deserted. An occasional car slipped through town without stopping. 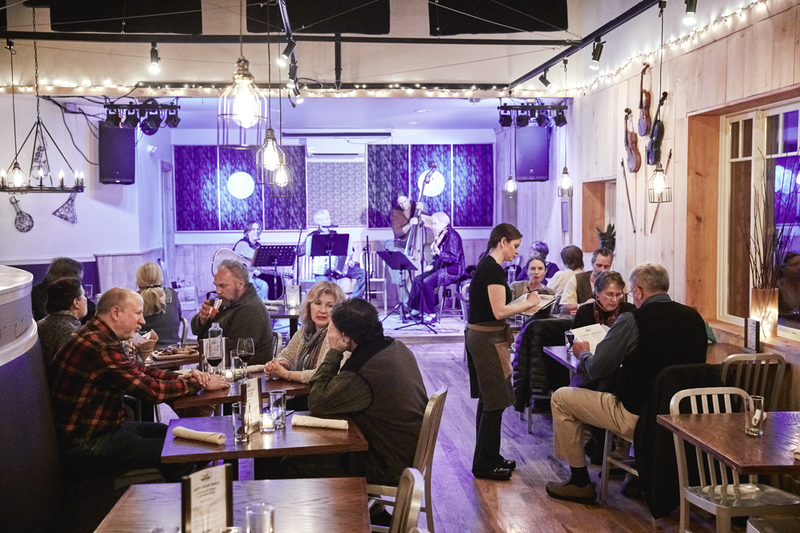 But on the narrow lane that loops behind the library, chef Carter Light and guitarist Jim Mitchell’s year-old restaurant and music venue, Coda, was humming. Most of the parking spaces in front of the low-slung brick building — in its former lives, a state liquor store and a doggy daycare — were taken, and the windows glowed invitingly. The glass door opened on an amber-lit dining room paneled in unpainted, rough-hewn boards and bisected by a gracefully curved banquette. On one side of the divider, diners dove into platters of oysters and sausages. 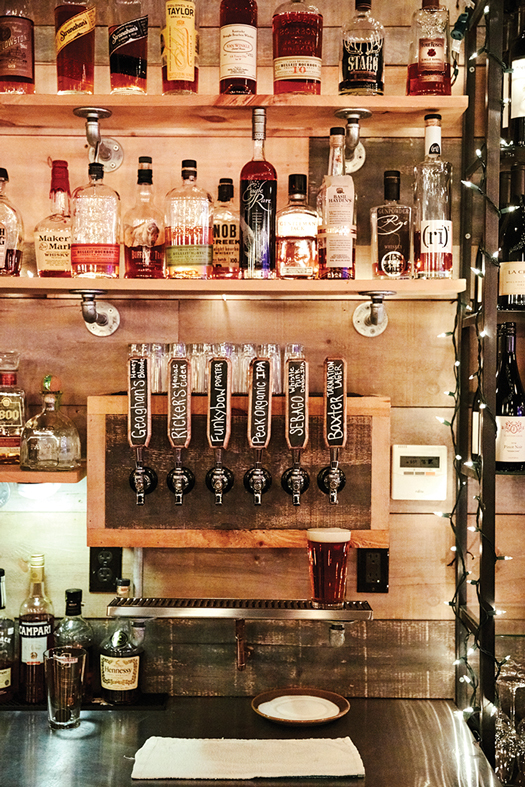 On the other, revelers clustered at the bar, chattering and sipping beer. Now and then, someone roamed among the tables to schmooze with friends. 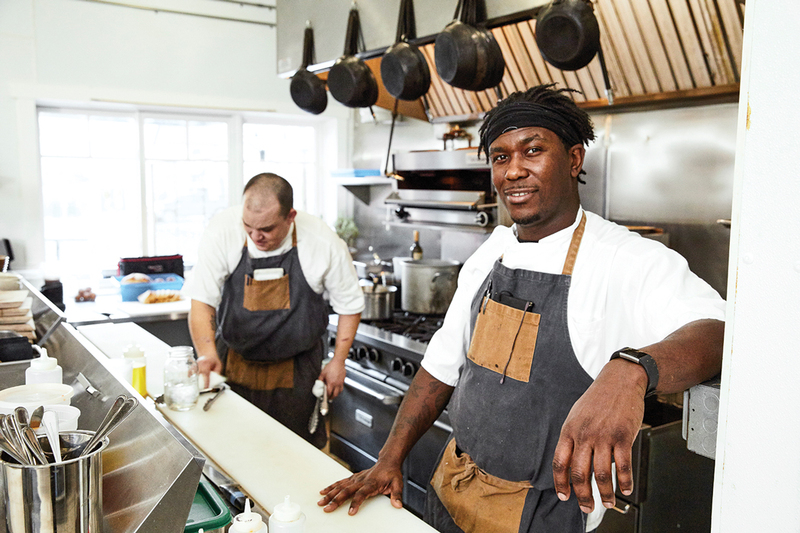 Sous chef Brandon Sanders (right) formerly manned the kitchen at Bar Harbor’s much loved (now sadly closed) Fathom. Sliders with bacon jam on pretzel buns. Light’s vision dovetails with Mitchell’s.  The pair was introduced by friends two years ago when Light, a Vermont native, was cooking in Utah and yearning to get back to New England; Mitchell, a Somesville resident, was looking to bring more year-round cultural life to Mount Desert Island’s Quiet Side. 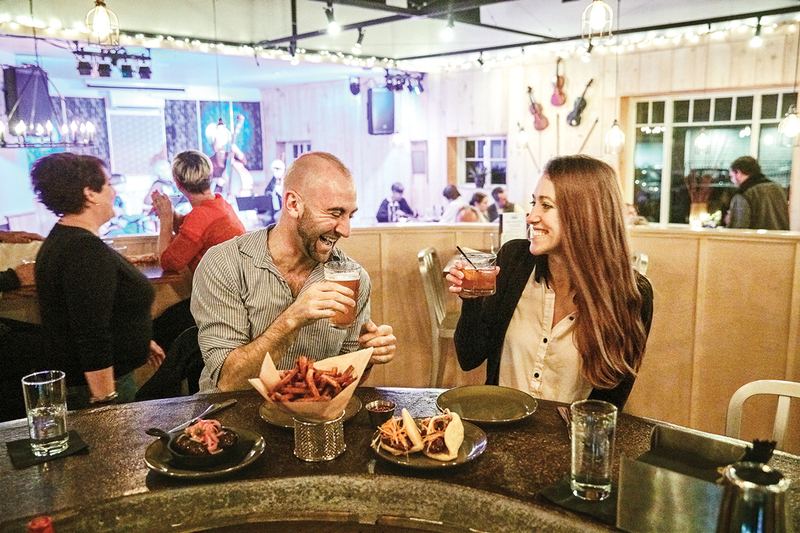 Now, Mitchell lines up musical acts and other entertainment a few nights a week at Coda, and Light’s snacky menu suits the cabaret atmosphere. Customers may order all their dishes at once or see where their appetites lead them as the evening unfolds. 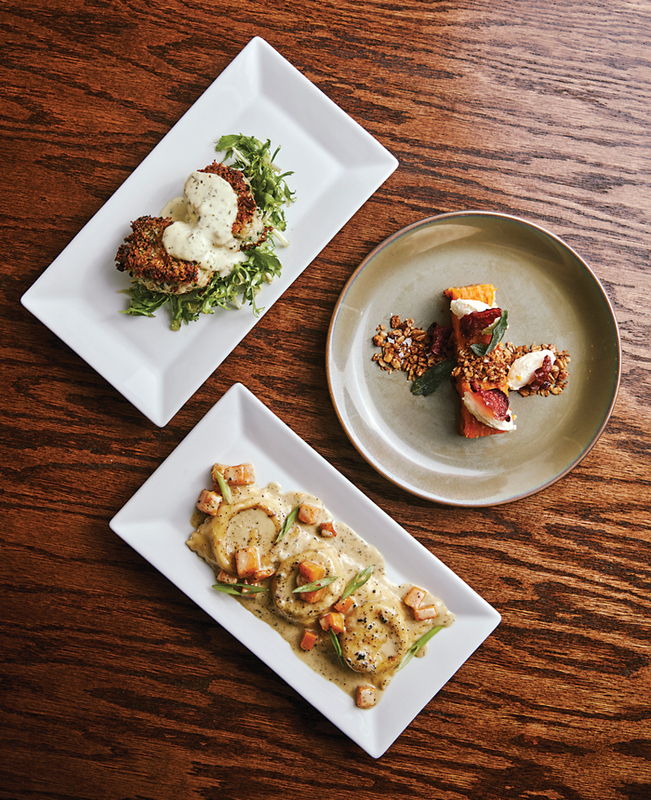 Aioli-drizzled crab cakes; terrine with fall vegetables; butternut squash ravioli with sage in brown butter and cream. 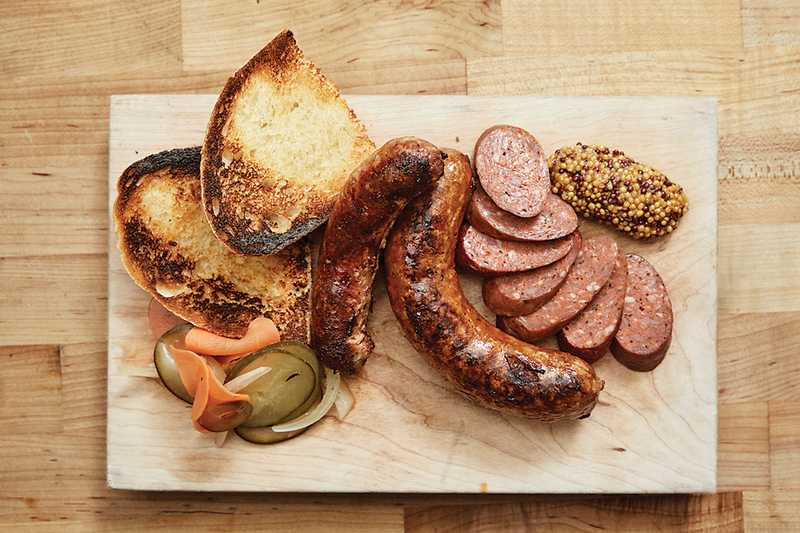 A charcuterie board with a pair of fat, grilled chili-paprika pork sausages, slices of smoky andouille, a tangy-sweet dollop of coarse mustard, pickled carrots and peppers, and thick slices of whole-grain toast — all house made — makes for satisfying nibbles, particularly when accompanied by a robust Maine brew like Cadillac Mountain Stout or Funky Bow Midnight Special Porter. We enjoyed the sausages as a first course with a simple arugula salad that was perfectly dressed (which is to say, just barely) with an olive-oil–preserved-lemon vinaigrette. Chopped sugared pecans and thin ribbons of salty Parmesan were a yummy contrast to the arugula’s pepperiness. Next, our server brought two plump crab cakes drizzled with lime and cilantro aioli, and a deep red-orange paprika chicken thigh and wing arranged on red-tinged pan juices. The crab cakes’ crisp, browned exteriors gave way to moist, light crabmeat, scarcely held together by smidgens of aioli and panko. We forked the rich chicken meat with bits of cidery braised green cabbage, savoring the combination of sweet and smoky flavors. 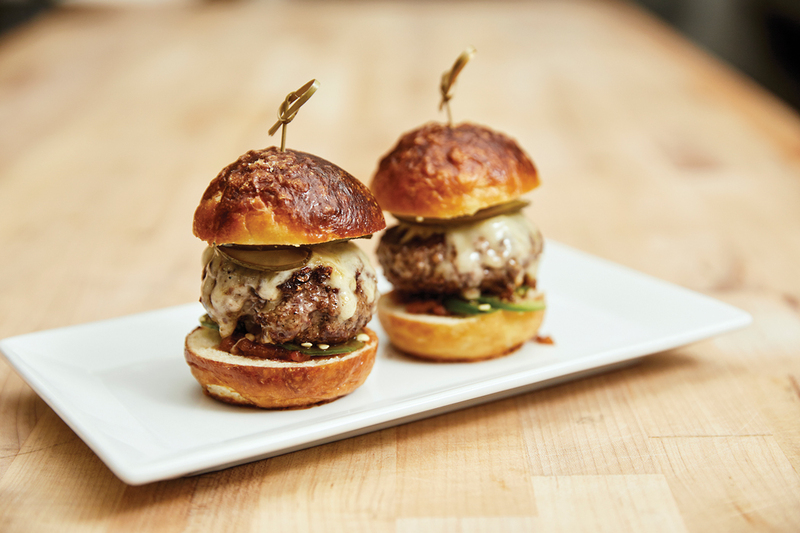 When a server delivered a basket of smoked-paprika fries and a plate of sliders topped with rich-brown pretzel buns to a neighboring table, we wished we’d saved room in our bellies. 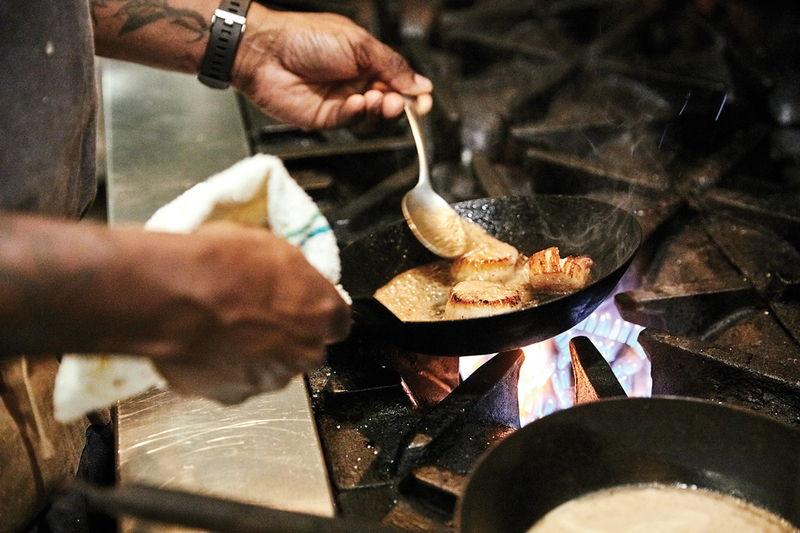 Next time, we vowed — and we’ll get the lobster and grits too, Light’s twist on a Southern staple, complete with Old Bay sausage and a poached egg that you can scramble into the cheesy, coarse cornmeal. 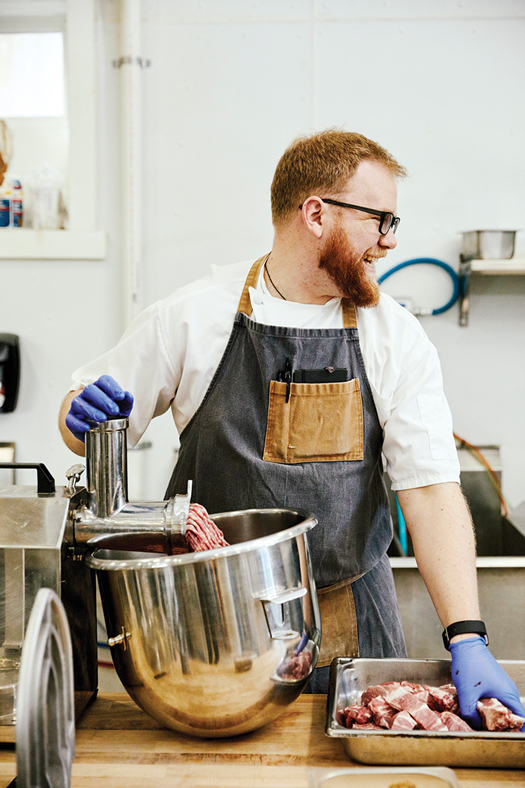 Executive chef Carter Light grinds organic pork. 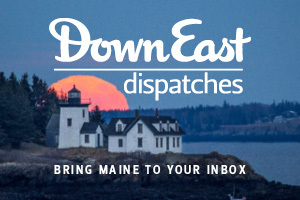 Maine-made beers (and the rare draft cider). House-made sausages served with whole-grain mustard, pickled veggies, and toast. 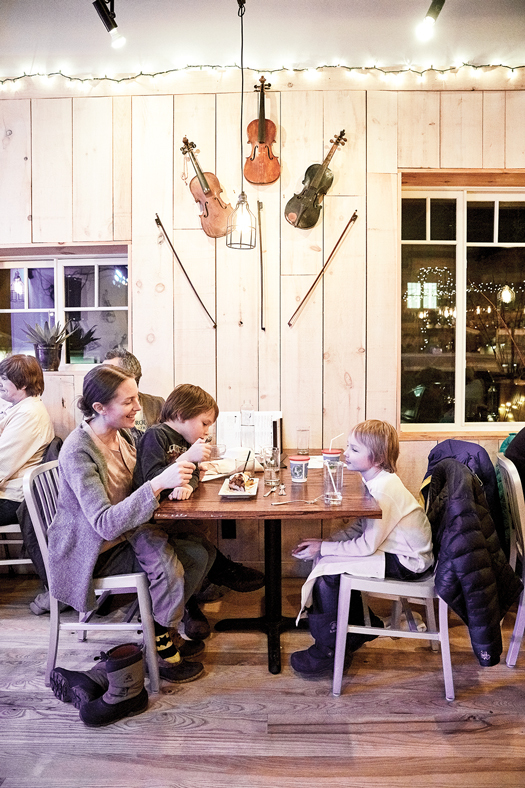 The dining room’s rustic barn-style walls are minimally decorated with fiddles and other musical instruments. The small plates are not only generous, but reasonably priced, from $8 (lamb meatballs with harissa, crème fraîche, and pickled red onion) to $16 (seared scallops with red miso, soba noodles, and sesame habanero oil). While the culinary influences are wide ranging, Light admits to a particular fondness for German cuisine — hence the sausages, späetzle and cheese, and dishes spiced with paprika. “I enjoy German food probably more than anything else,” he said. “I cooked Italian for a long time out West, and then I did very fine dining, and what I realized is I’m drawn toward comfort food. If you put care into them, like we do with the sausage and the mustards and the späetzle, they’re so good. You can make them elegant and delicious, and you don’t have to charge $45 a plate.” The pork in our sausages and our chicken came from Tide Mill Organic Farm in Edmunds. 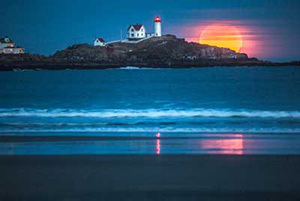 Light also buys meat from Maine Family Farms Meat Company in Portland. For dessert, bread pudding was a taste of home, elevated by sourdough bread, sprinkled with whiskey caramel sauce and topped with a heavenly, dense, and exceedingly creamy vanilla Zentopia Gourmet ice cream, a fledgling brand made in Coda’s kitchen by Southwest Harbor resident Robert Rhiel. It was another indulgence in pleasing contrasts — cool and warm, crusty and creamy — and unpretentious deliciousness.